The proposed extension of San Francisco's historic F-Line streetcar service from Fisherman's Wharf to Aquatic Park and Fort Mason took a significant step forward on Mar. 18 with the release of the project's Draft Environmental Impact Statement by the National Park Service (NPS). The preferred alignment is just 0.85 mi. (1.37 km) long. It would extend the existing westbound track one block to Leavenworth, turning left to Beach Street and a three-way junction with the eastbound track, then turning right on double track to the end of Beach and a "transition segment" that would narrow to a single track (image). 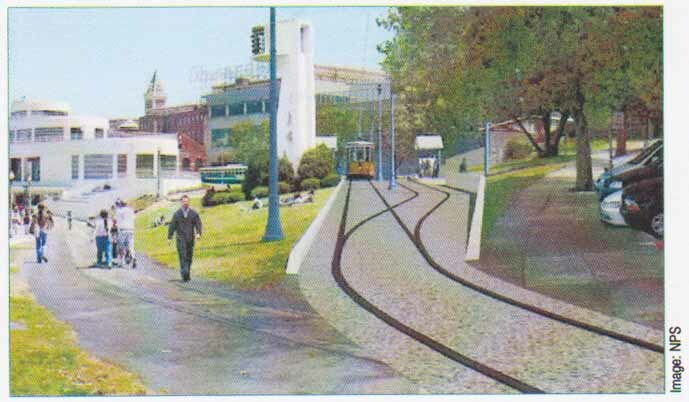 The streetcars would then enter a disused railroad tunnel under Fort Mason to a loop terminal just outside the west tunnel portal adjacent to Laguna Street. Headways would be limited to five or six minutes because of the single-track segment. The relatively cheap $28.9-million price tag includes rehabilitating the 1100-ft. (335.3 meter) tunnel, which was built in 1914. A 60-day public comment period on the DEIS is now underway and Park Service officials hope to have the final environmental impact statement certified by next January, allowing the Municipal Railway to begin final design and engineering. NPS has been the lead agency up to now because most of the extension crosses on or under federal parkland. According to the Market Street Railway, an all-volunteer enthusiast group which has been a major force in promoting the extension for almost a decade, the goal is to have the job completed in time for the America's Cup competition that will be held off the coast of the Marina District in 2013. However, despite widespread support for the scheme, there are no capital grants yet available. Municipal Transportation Agency spokesman Paul Rose told the San Francisco Chronicle that "... all options to identify funding, including private-public partnerships," are being considered.